Harry Seymour is from Bemus Point of Lake Chautauqua New York in the mid 1800s. Seymour decoys are solid and strong block forms and dull in color. He applied a bright red paint to the gill slits of his decoys and has been copied many times as his decoys bring high dollars when being offered. 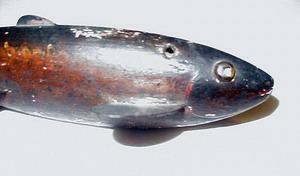 Beware of Copies & Fakes – www.fishdecoy.com shows some of Seymour’s work for comparison. Photos courtesy of eBayer captirv of Bath New York.